Heartbreak on the red carpet: The most dramatic moment of day one came outside of the judging and away from the prep kitchens. I had about 15 minutes to kill before the press tasting so I decided to check out the full presentation sculptures which were set up for public viewing. It’s set up just like a museum with felt ropes to guide the throngs of visitors past the spectacular and highly technical showpieces. Then, all of the sudden, a loud gasp was heard from the crowd as the sculpture from Olliver Maxime, from the J House Hotel, lost an arm which then struck the platform holding the entremet causing it to crash to the ground. Despite the shock from the crowd, this can happen to even to the most accomplished pastry chefs as evidenced by the scenes about the MOF competition in Kings of Pastry. Besides, these chefs are pushing the envelope and these sculptures require the highest level of technical skill, so it’s not surprising that some pieces may be fragile. Ollivier’s wasn’t the only sculpture to suffer damage on Sunday. 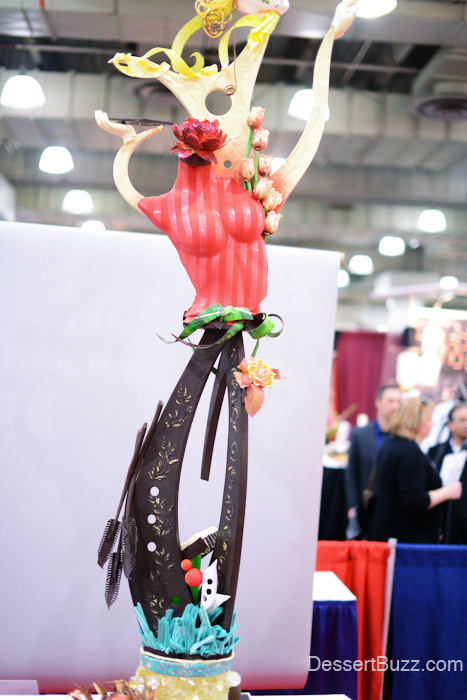 Another competitor, Matthew Marotto, who had a very tall and beautiful sculpture had some issues on route to the show. It seems the rough New York City streets had caused the sculpture to break on route to the show. 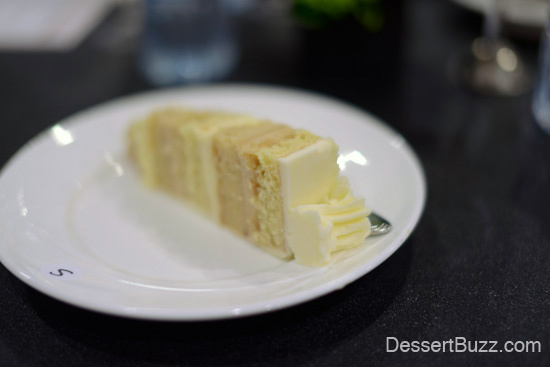 This forced the chef back to the kitchen to make emergency repairs that he hoped would hold. 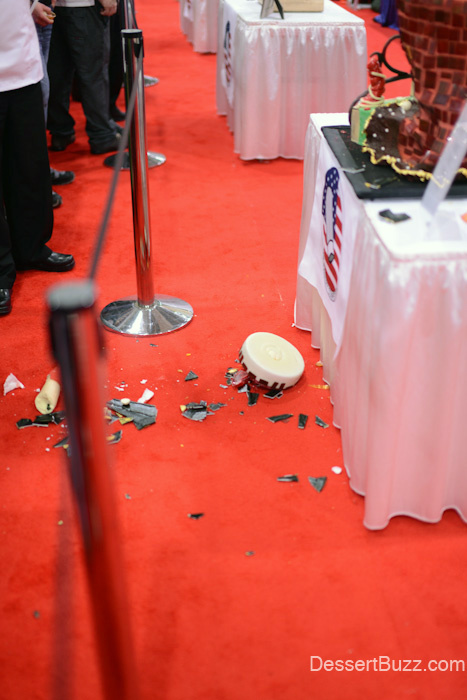 Unfortunately, the sculpture suffered some more damage after having been repaired earlier and the stand that was supposed to support his entremet was damaged. 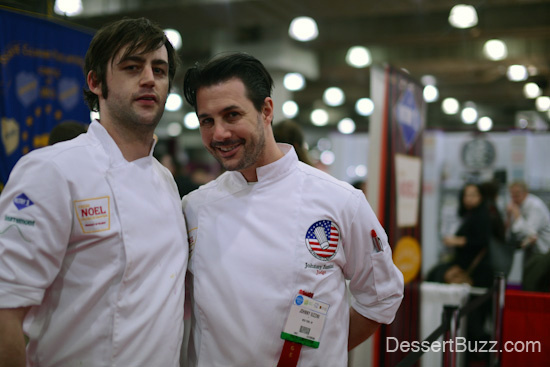 As a result of this stressful event, Johnny Iuzzini (who inspired Marotto to become a pastry chef in the first place) took Marotto aside and explained what a success it was just to be selected up until this point. Plus, now he would have the experience for the next competition. Interestingly, when I mentioned the famous scene in Kings Of Pastry, Morotto said he had never seen it! In any event, I’m sure this won’t be the last time we hear from Matt. 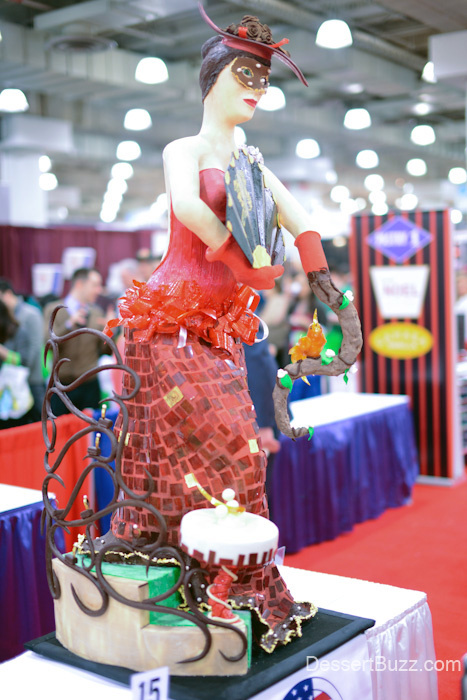 Follow DessertBuzz on Twitter for more updates on the US Pastry Competition. Our first feature on yesterday’s event is here.